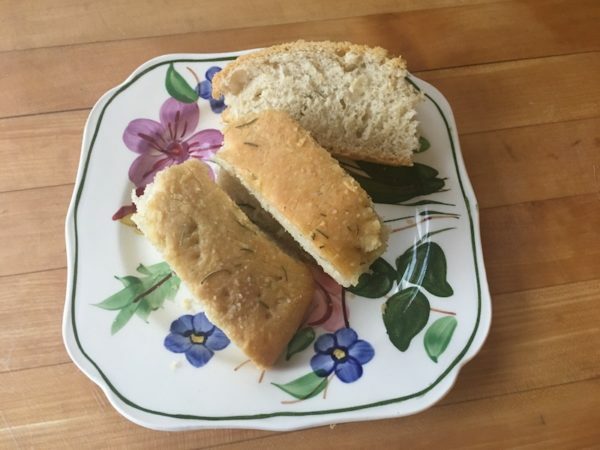 One of my favorite kinds of bread is focaccia. It’s a fairly flat Italian bread that is flavored with olive oil and herbs. My herb of choice is rosemary. The first loaf I bought was at Aurora Provisions in Portland, Maine. I love that place! There were several loaves in a basket and you picked the one that called out to you the loudest. The scent of rosemary was intoxicating and the little holes that were poked into the crust were oozing with olive oil. I’ve bought many loaves of focaccia at Aurora’s. It’s challenging to make it home before breaking off a piece, but every once in a while, I’ve managed! I’ve since started experimenting with making my own focaccia. 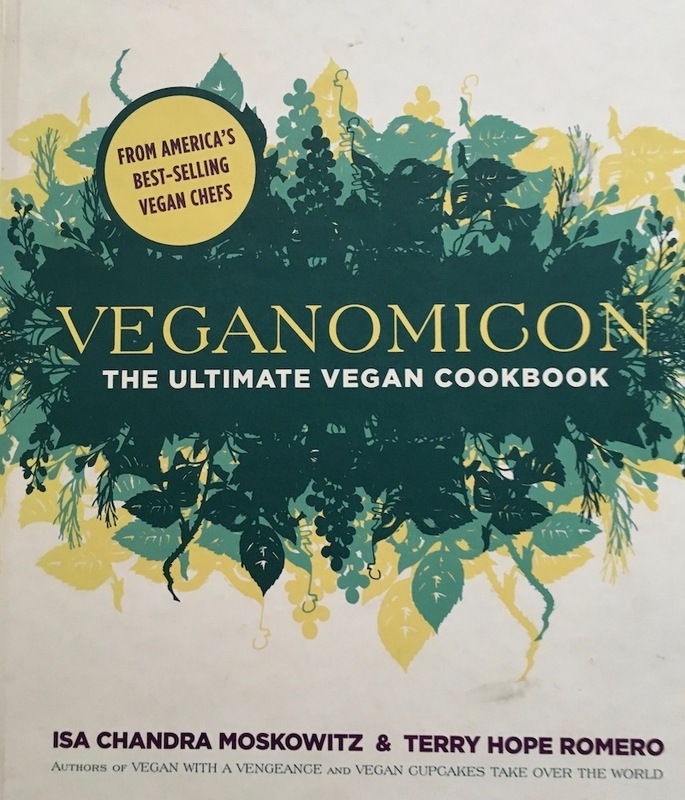 This recipe comes from Veganomicon: The Ultimate Vegan Cookbook. My daughter and son-in-law are vegans and whenever I’m at their house I like to browse through their cookbooks. When I saw this recipe I decided to give it a try. Baking bread is not hard at all and it’s so soothing to knead the dough, watch it rise and then smell it in the oven. And the ultimate satisfaction is cutting that first slice and eating it while it’s still warm. Next best thing is toasting a big slice for breakfast. Combine the yeast and warm water in a large bowl. 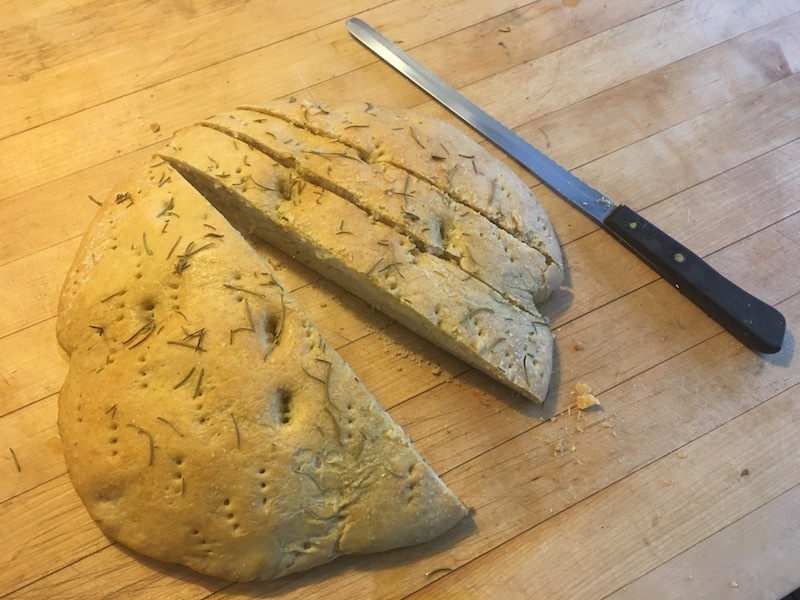 Stir in the olive oil, chopped rosemary, and flour and knead to form a soft dough. If the dough is sticky, work in a little flour, one tablespoon at a time. Turn the dough onto a floured surface and knead for 5 to 6 minutes, until smooth. Pour a little olive oil into the original bowl, add the kneaded dough and turn a few times to coat the dough with oil. Cover with a clean dish towel and let rise 1 hour or until a hole poked into the side of the risen dough slowly fills up. Punch down the dough, return it to the floured surface and knead a few times. Using a floured rolling pin, roll the dough into a large circle about 1 1/2 inches thick. Poke several holes into the dough with a fork, sprinkle with coarse salt and rosemary leaves, and brush with a little olive oil (or even soy milk, for a matte finish). Cover again with a dish towel and let rise for 20 minutes. While the dough is rising for the second time, preheat the over to 350°F. Bake for 30 to 35 minutes until the bread is lightly browned and firm. Remove from the oven and let cool for 10 minutes before slicing. I am eating a slice (toasted) as I write this post. Ultimate comfort food. Focaccia goes great with just about any meal (or all by itself.) And this time of year, it’s especially good with soup. Speaking of which, you should try my recipe for sweet potato soup. And here’s another one for sweet potato, coconut and chipotle soup from El Rayo Taqueria. You are welcome!